This renovated former factory buildings features attractive apartments in Hanover's pretty List district. Guests enjoy well-equipped apartments as well as all the comforts of a hotel. 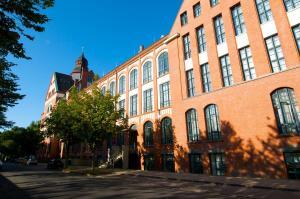 The Gästeresidenz PelikanViertel offers fresh and tastefully furnished apartments in various sizes. All apartments are fitted with a kitchenette, which can be equipped with all necessary utensils and crockery upon request for a deposit. Washing machines and dryers are available as well as an iron and ironing board. The Gästeresidenz PelikanViertel also offers a shopping service. Stop by the bar at the end of the day for a drink and a chat. The friendly staff are available for questions and recommendations 24 hours a day. Hanover town centre and Hanover Central Station are just an 8-minute tram journey from the Pelikanstraße tram station, which is just a 2-minute walk away.